DESINA stands for DistributEd Standardised INstAllation Technology and is a standardisation for components used on industrial machines, including the drives, control systems and cabling. It’s a great idea with many benefits, but, where it relates to cable colour coding, the situation may be a little confusing and there’s room for error. The DESINA standard was created by members of the German Machine Tool Builders’ Association (VDW) in conjunction with key automotive manufacturers and suppliers. 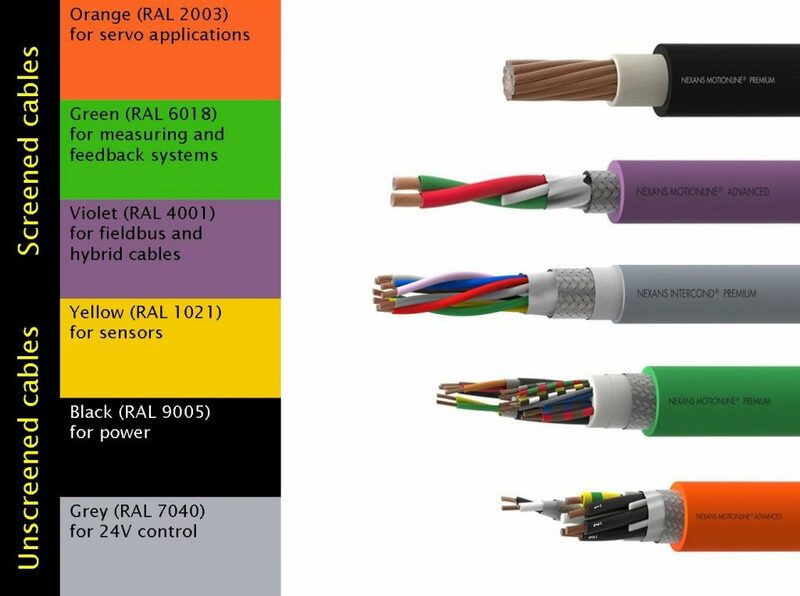 The objectives were to reduce the variety of components, simplify design and avoid errors in assembly, but ambiguity when it comes to cable colour coding has recently led to some confusion. For example, one cable manufacturer, in an attempt to comply with DESINA, recently changed the colour of its cable for feedback on servo systems from orange to green. Although the new green cable was identical in terms of its specifications to the previous orange one, it demonstrates how misinterpretation is not uncommon with DESINA colour coding. The RAL system of colour coding, used by DESINA, is a colour matching system used in Europe mainly for defining varnish and powder coatings. It is used throughout industry and was originally created by the German RAL, a subsidiary of the RAL Institute. Being aware of what the colours are meant to indicate is useful, but it shouldn’t be a substitute for being thoroughly aware of a cable’s exact specifications and the use for which it was intended. For example, some cable manufacturers are now offering grey cables, with screen, for use as feedback cables. Remember, unscreened grey cables are defined as 24V control cables by DESINA. So, always speak to your cable manufacturer or supplier if you’re not sure. You can download a copy of the chart using the link button bellow or, alternatively email us or give us a call.